Facebook accounted for one in every five social media referrals in March 2014, a percentage point gain of almost six percent since December of last year, reveals new data from Shareaholic. 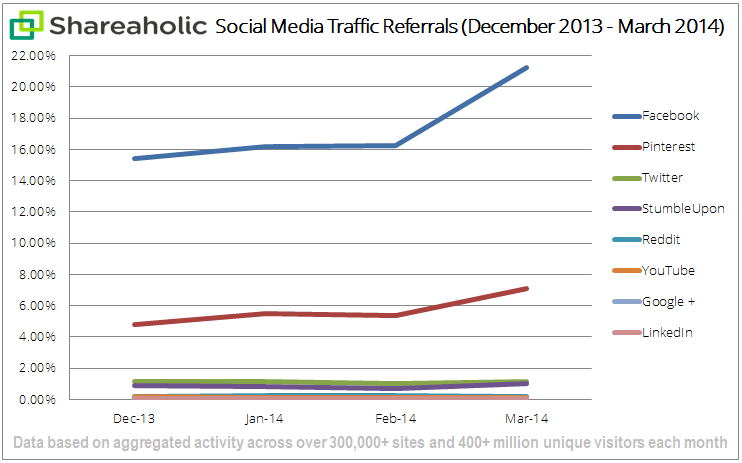 Facebook drove 21.25 percent of social referral visitors last month, up from 15.44 percent in December 2013. 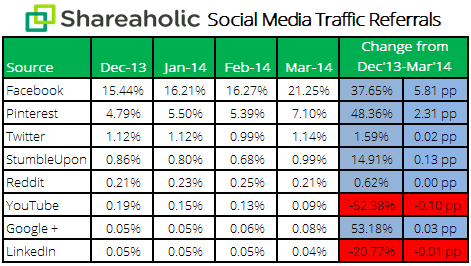 Twitter, meanwhile, was responsible for just 1.14 percent of social referral traffic in March, up just 0.02 percentage points since December. Pinterest’s share of referrals last month was almost seven times that of Twitter (7.10 percent, up from 4.79 percent in December) and Twitter faces a bigger challenge from Stumbleupon (0.99 percent, up from 0.86 percent) than it is imposing on Pinterest or Facebook. And in the race for the wooden spoon, Google+ (0.08 percent, up from 0.05 percent) is barely holding off LinkedIn (0.04 percent, down from 0.05 percent).